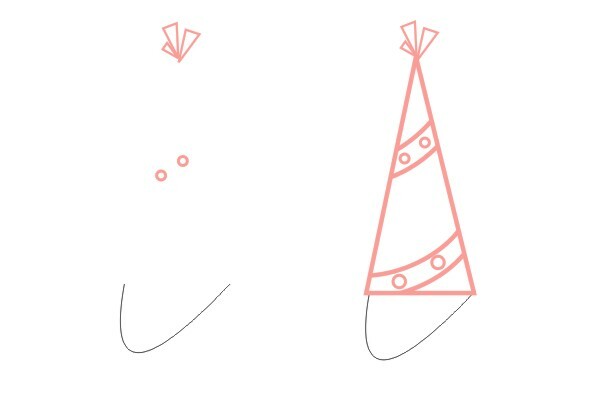 This CorelDRAW tutorial I wanna show you how to create design a set of happy birthday vector. We will use some Basic Tool like the Regtangle tool, mostly the Ellipse tool and modify them using the Shape tool. 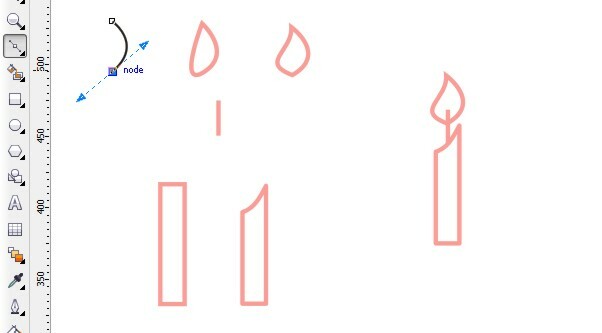 Draw four regtangles using the Regtangle tool (Y) to create the gift. Set the Outline width= 3 pt, No Fill and give the Outline Color is pink. 1. Select the big square and the wider regtangle shape (see below). Select both objects with the Pick tool and trimming them by using the Trim icon in the Property Bar. 2. Pick the wider regtangle and the tiny regtangle. Select all shapes then click the Simplify button in the Property Bar. 1. Place the small square in the center. Go to Arrange>Align and Distribute>Align Centers Vertically or click (C) on you keyboard. 2. Add the ribbons using the Ellipse tool. Rotate 50 degrees. Copy and Paste. Hit Mirror Horizontally. Select all objects and group them (Ctrl+G). 2. Create a triangle shape with the Polygon tool (Y), sides= 3. 3. 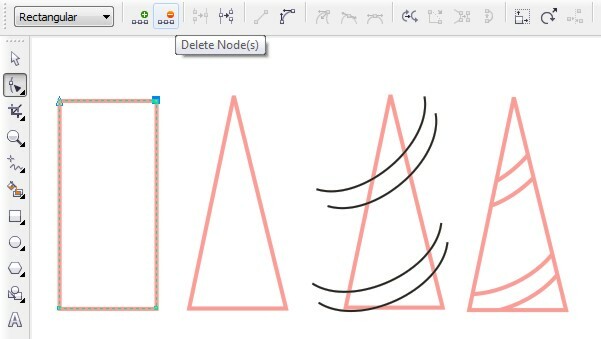 Pick the Bezier Tool, draw a straight line and modify with the Shape Tool. Please make sure choose the Convert Line To Curve icon. Got to Arangge>Order>To Back of layer (Shift+PgDn). The outline= 1pt. Group them together. 1. Draw a regtangle using the Regtangle tool (Y). Click Convert To Curve icon in the Property Bar and delete the one of the top nodes than drag the left-top node to the middle. 2. Take the Freehand Tool. Draw a curve. Copy and Paste. Make it to four curve lines. Select them. Put it the top of the triangle shape. Trimming them by using the Trim icon. Delete the curve lines. We don’t need its anymore. Creating the elements of the hat. 1. 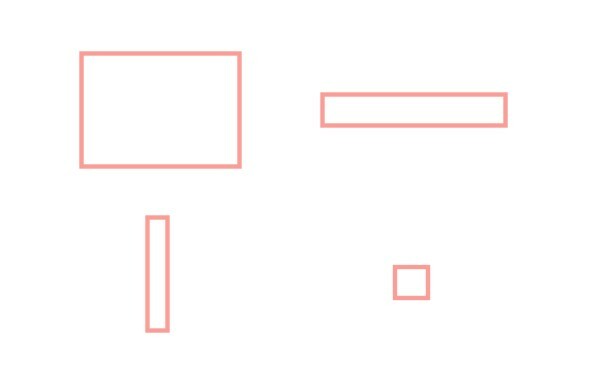 Make three triangle shape with the Bezier Tool. Put them to the top of the hat. 2. Draw two circles. Set the Outline= 2 pt. 3. Using the 3 Point Curve Tool to create the rope. Set the Outline= 1 pt. 1. Create the oval shape and one regtangle to cut off the oval shape. 2. Copy and Paste the half of oval shape. Make two tiny ellipses. Select the top ellipse or black ellipse and a half of oval shape by pressing the Shift key. Then click the Weld button. 1. 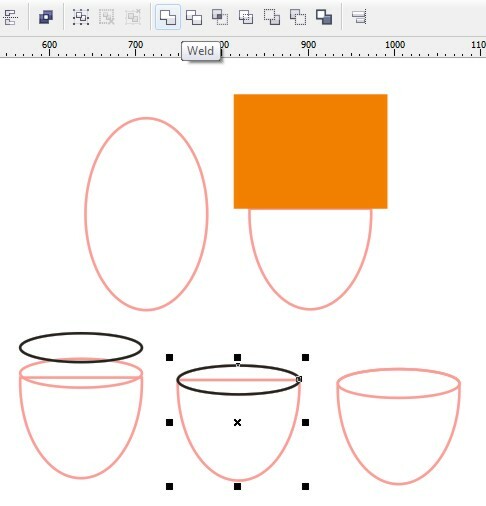 Take the Regtangle tool (F6) to create the tiny regtangle shape and make another ellipse. Select all objects and press (C) on your keyboard. 2. Create some bubbles and duplicate the previous shape (step 7). Imagine that is the water. 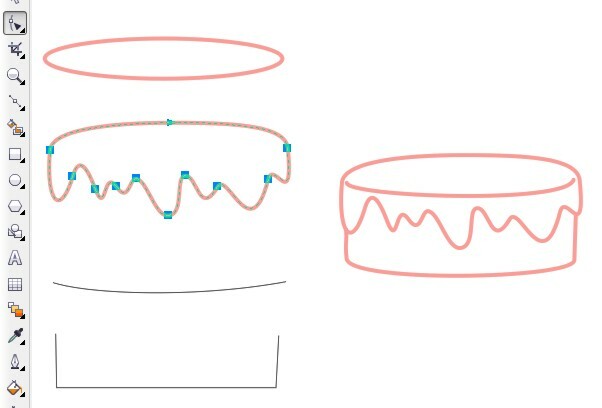 1.For make the cake, we need the Ellipse tool again and click Convert to Curve (Ctrl + Q). Still the Shape Tool. Adding some nodes (see picture below) with clicking Add Node in the Property bar. Change the lines to curve. 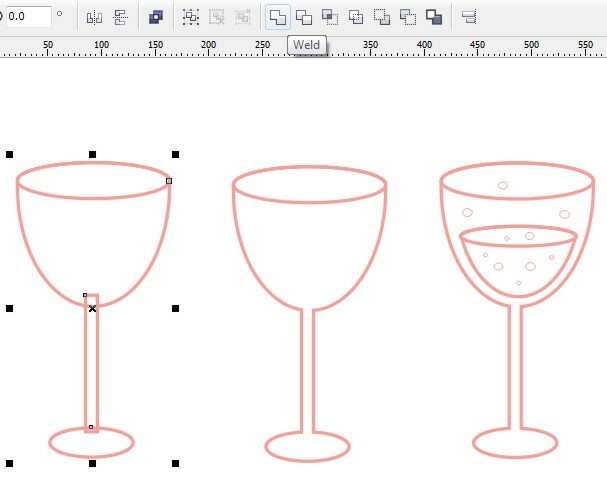 2.Using the Bezier tool draw the lines like image below (picture 3 and 4). For the picture 3 make sure make it curve. 1. 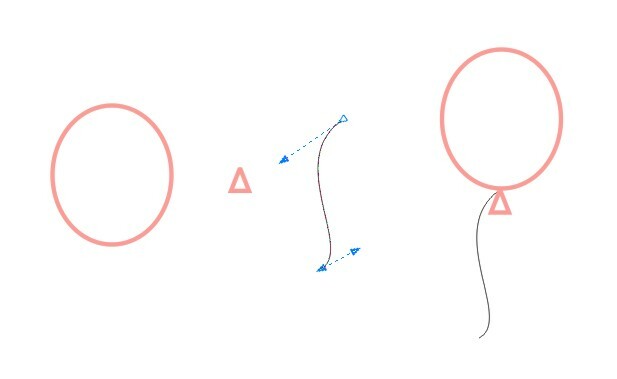 Take the Bezier Tool. 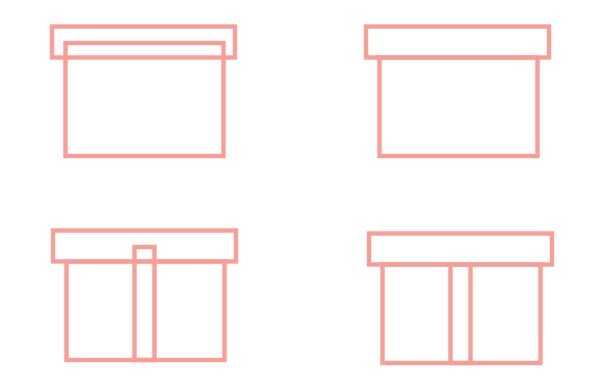 Set the Outline= 2 pt, choose Rounded. Then click the Make a Cusp in the Property Bar. 2. Using the Polyline Tool. Make a straight line. 3. Draw a regtangle. Convert to curve (Ctrl + Q). Grab the Shape Tool, change the node top by clicking the Convert Line To Curve. Here’s you go. 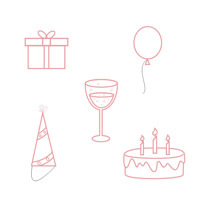 We just created the happy birthday vector set. That you can use them for making wallpaper, the gift warp or pattern. I hope this tutorial will usefull for you, people.